As I see it, the technology that removes that step stands to benefit most for its simplicity. NFC is a perfect solution by design (if imperfect by current deployment) because it will include device endemic hardware that removes the need for app downloads and camera activation. In fact, with all the designer app readers in market, the consumer is still required (or thinks he is required) to download the “correct” reader to access the content. This adds 6-10 steps to the process that further separates the user from a clean interface. NFC promises to remove those steps, making it a true “ready, out-of-the-box” solution. The marketer willing to inject simplicity into the experience will be first to benefit because we’re basically a tactile people—we like to touch things. If all that is needed is a simple touch to gain access to any mobile content, the onus moves away from the experience of getting to the content and makes it all about the appeal of the content itself. I’d also suggest that the need to reinvent the wheel with every new campaign will abate because simplicity will remove the barriers to entry and engagement. NFC has a long way to go before it’s integrated into enough phones and enough consumer lifestyles to label it the game changer. However, it’s by far the fastest growing technology in the world- showing a 5X increase in US availability since the end of Q1 ’12. There are now close to 20 million phones activated in the US, up from zero at the end of 2010. That’s close to 15% of the phones today, assured of an unprecedented increase thanks to the promise from all mobile providers and operating systems (save iOS) to integrate moving forward. This dedication is the direct result of efforts from the triad of financial, credit and telecommunications heavyweights spending billions on NFC R&D that promises to change the way we access, share and spend money. The fact that we see NFC as a way to connect friends, brands and consumers is almost rudimentary, when we consider how these simple transactions will benefit the ecosystem when ready. It’s 1994 again…but imagine if back then- we asked people to use a credit card to buy goods online before ever asking them to “surf” or use mapquest on their Netscape browser? We may never have seen the growth of online commerce, at least not in the time frame we allowed. The PRE-Apple Factor – The more triggers the better! A lot is made of Apple’s lack of participation in the NFC experience to date. Folks in the business will lie and tell you that this is no big deal…that Apple is just 6-8% of the world mobile market- or 30% here in the US. That leaves a massive audience of NFC enabled devices that are now or will upgrade almost immediately. True. But what Apple lacks in market share- it more than makes up in mindshare- making it easily the most ubiquitous tech brand of the 21st century. There’s simply no replacing Apple in this market and it’s not a matter of if the iPhone needs to be included. IT MUST BE in order for NFC to enjoy the adoption it deserves. 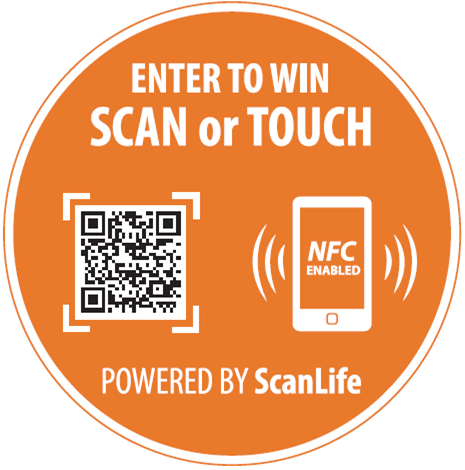 Until it does, NFC campaigns will require a QR Code to assure consumer engagement. This creates a powerful opportunity for companies like Scanbuy to introduce the technology to a well-established client base- not to replace its core technology, but to solidify its trigger-agnostic approach as it helps to transition customers to use the right solution at the right time. For a company like Scanbuy- there’s no need to force-feed and new technology- we see NFC as just another mobile trigger across all areas of mobile engagement. Back to Apple- industry insiders are now under the emerging opinion that just as NFC needs iPhone- iPhone now needs NFC in order to tie in to the financial ecosystem fast on the come. I agree…but more because I believe Apple is losing the innovation battle with Samsung, SONY, HTC and now, even Nokia’s WP8. At no time in the last 7 years has this been even a remote possibility and in the period of less than 2 cycles, is now forcing Apple to come up with something new or at least on par with the new devices in-market. It may not be 5S but I’m in agreement that iPhone 6 will have NFC and the entire world as we know it will change. OK…the entire NFC world, that is. One factor that can’t be underscored enough is NFCs reliance on other triggers. At this point, with penetration still so low, marketers forever in need of material response would be negligent to rely solely on NFC in a campaign. This is why pure-plays still use QR Codes in their campaigns. The irony is that these companies continue to blast QR Codes in their pitches and literature…despite undeniable codependency. Talk about biting the hand that feeds….With scan to tap ratios still in the 10:1 area- there is no question that NFC needs QR Codes to meet client needs. In short, QR Codes and NFC can and should operate together to ensure that driving response is always our core objective. Stay tuned for next week’s Series 1: Part Two post where we’ll discuss The POST-Apple Factor, Chip Prices, So, Who Wins in the Short and Long Term? And most importantly The Winner.